Tea time! 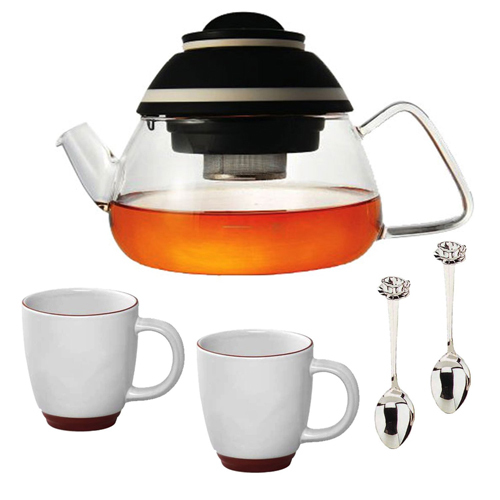 The Dalla Piazza Delicha Automatic Tea Maker + 12OZ. Halo Bistro Wide Body Coffee Cup + 4.5in. Cup & Saucer Demi Spoon not only comes with a bunch of tea stuff like spoons and saucers, but the darn thing can actually keep track of time too. Featuring a “patented timing mechanism,” the automatic tea maker steeps tea (or coffee) and then lifts the steeping basket out of the brew when time is up. The timer can go up to seven minutes, which happens to be about how long it takes to read that product title. Good thing a nice cup of tea is worth the wait. Which one of these is not like the other? The question, of course, is a trick: they are both like each other. 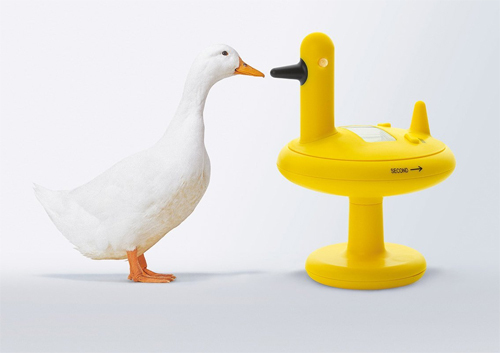 But don’t worry, if you get the Alessi Duck Electronic Kitchen Timer mixed up with the real thing, the duck will let you know! Unlocking the secrets of the kitchen is only a matter of time. Sometimes that time can be measured in minutes. At least if the Kikkerland Safe Kitchen Timer is involved. 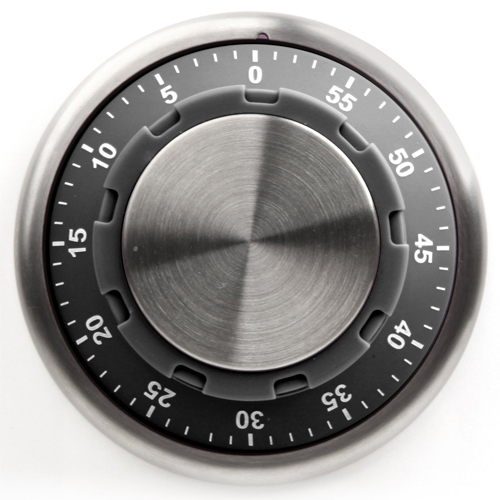 Featuring a 60-minute countdown timer and a fancy design that resembles a safe lock, the kitchen gadget is magnetic and sticks to the fridge until it is time to crack open a safe or some eggs–whichever the case may be. And best of all, at less than 20 bucks it won’t break the bank. Whooo knew, but apparently owls are good at keeping time. Use the Kikkerland Owl Shaped Cooking Timer to keep track of all your baking needs–as long as that doesn’t include blackbird pie. As far as nursery rhymes go, that’s a pretty tame one, but still birds of any feather don’t appreciate it. Sing a Song of Sixpence somewhere else. But these owl-themed timers (available in your choice of color) would be more than willing to help you bake an apple or cherry pie. Cows don’t seem to be particularly well-suited for keeping time, but hey, maybe they are. At least in the kitchen. 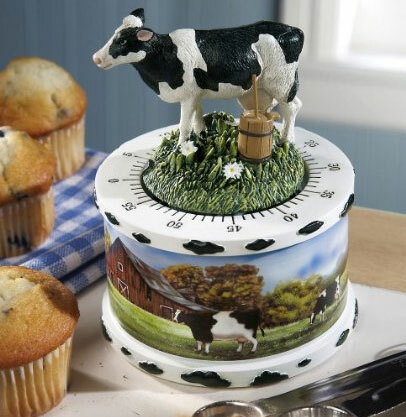 In any event, the Country Cow Kitchen Timer is willing to give it a go. At least for up to 59-minutes, but beware: that could mean anything in cow-time. Cooking can be deadly. Hopefully yours isn’t, but just in case, there is a way to warn your guests. 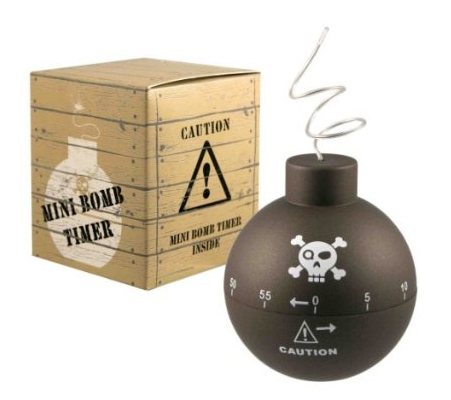 The Time Bomb Kitchen Timer is a simple little kitchen timer, but the implications are explosive. If someone you know has cooking skills that could use a little work, then maybe this is the gift to get them. Then again, that could always blow up right in your face too.